The island has a calming soothing energy that is truly mesmerizing. 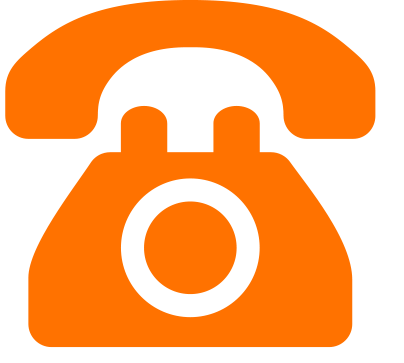 The word “magic” is often overused without really knowing what it means. However life rewards us with experiences that exemplify magic in all of its facets. For me that was a recent trip to the island of Dominica, an experiential travel destination I embarked on to explore the island for our clients and build relationships with locals. There I was welcomed into the home of Neil and Victoria, who moved there from the USA five years ago and now call Dominica home. Through them, I was introduced to Sybil a wonderful woman whose passion is nutrition and well-being in all of its facets. A memorable highlight was being invited to meet the island’s most well known and respected bush doctor and herbalist Moses. After returning home I have been wearing a smile on my face and tranquility in my soul, which simply will not go away. Several of my friends, including someone I had never met before, noticed a particular glow in me, while I am always a happy and enthusiastic person, as a result from the trip, I have been feeling purely energized. The island has a calming soothing energy that is truly mesmerizing. The island of Dominica (not to be confused with the Dominican Republic) is a relatively undiscovered place, nestled in between two other Caribbean islands, Guadeloupe and Martinique. A lush, tropical island with an area under 300 square miles, and a population of 72,000. The unspoiled environment, geothermal volcanic activity (including the world’s second-largest hot spring, Boiling Lake), countless plant species, hundreds of rivers and waterfalls are the reasons why Dominica is known as The Nature Island. While today’s history narrates that it was Christopher Columbus who discovered the island (and named it for Sunday in Latin) it is very clear that this island exists as it does thanks to the migration of South Americans that started around 3,000BC. The island’s original tribes that called it “Waitukubuli” meaning “Tall is her body” in the language of the Kalinagos. Since its discovery the island became a French colony and then British, and finally in 1978 it became its own nation. English is the official language in Dominica, however the locals, especially in the Kalinago territory, speak a French-Creole language. I am truly honored and touched by the kindness encountered all over the island by the locals as well as by Mother Nature. In the Carib Territory while visiting a small village where the Kalinago people live, I was welcomed into one of their homes, I was shown around the house, and the gardens. 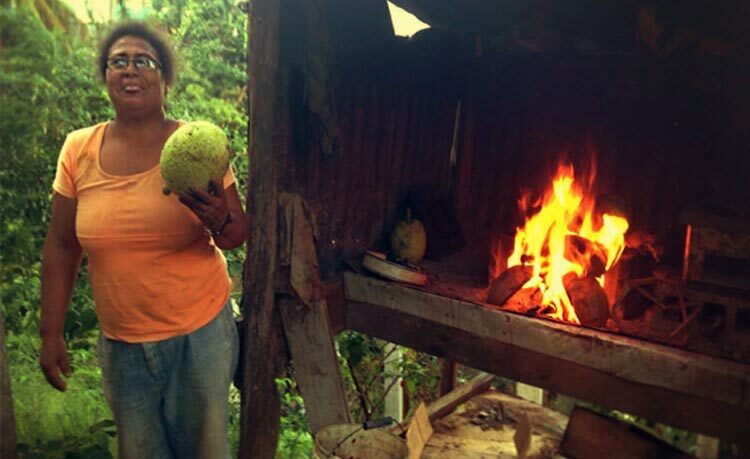 I even watched them cook a breadfruit in an open fire, but better yet they gave me several fresh guava for the road. Dominica is an investment into your well-being, relaxation and renewal. When you land in Melville Hall you get a stunning sensation and welcoming view of its natural beauty, like dropping into lush green paradise. Once you drive inland the true adventure begins. I arrived at Neil and Victoria’s home in pitch dark, unaware that I was in the heart of the rain forest. Getting out of the car, the first thing I heard was the sound of the Cacao River, then I noticed the stars and felt like you could reach up and grab them. The sounds of the river and the rain (often only coming down at night, depending on the season) accompanied my sleep, a sensation I did not want to go away. In the morning I woke up to the pounding of rain pouring down as I never heard before. 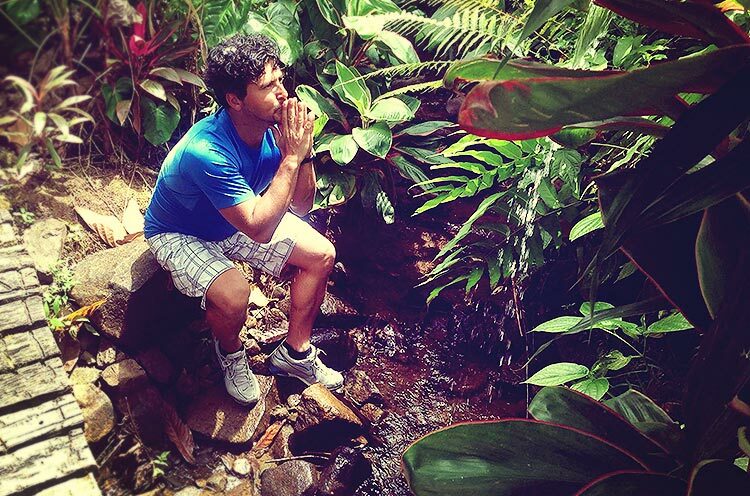 After a half hour the kiss of the sun led to an orchestra of birds welcoming me to Dominica. As I walked to the river around a banana plantation, I realize that never before in my life I had seen so many shades of green, not even in Oregon where I live. I lifted my eyes and, as if frozen in time, I felt like a tiny creature in a vast incredible paradise where there were no familiar sounds. The busy and annoying freeways gone, cars gone, heavy polluted air gone, the clacking of office keyboards gone, phone ringing gone, busy crowds gone, stress gone, it was just me, the rain forest and its concert of colors, sounds and natural beauty. 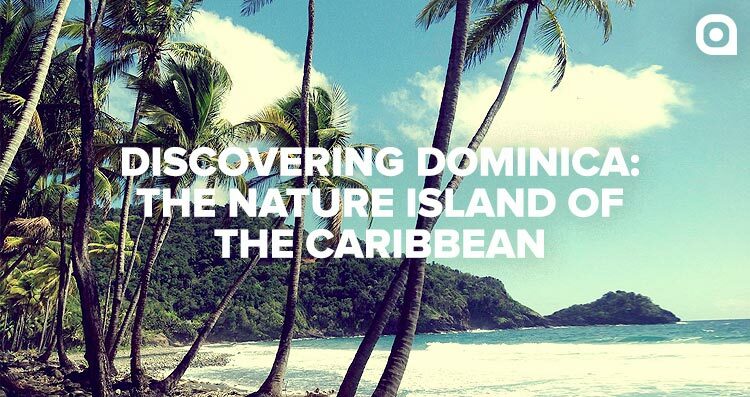 Dominica is an investment into your well-being, relaxation and renewal. And there is no better way to do this than with a wellness retreat to take care of your happiness, mental and physical health, sanity, optimism, and balance. 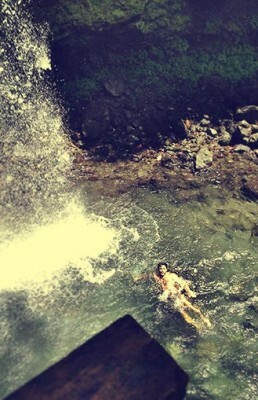 Dominica has a wealth of rivers, waterfalls, pools and lakes and amazing hikes. While you could adventure on some of the nature paths and hikes on your own, nothing compares to having a local take you and share with you their knowledge and insights. At times is it strongly advised that you go on certain hikes with a local, Victoria Falls is one. To get to the waterfall you have to walk through the river currents, climb over, up and down on slippery rocks and if you do not know where you are going, it can be dangerous. The reward once you get there is completely worth it! 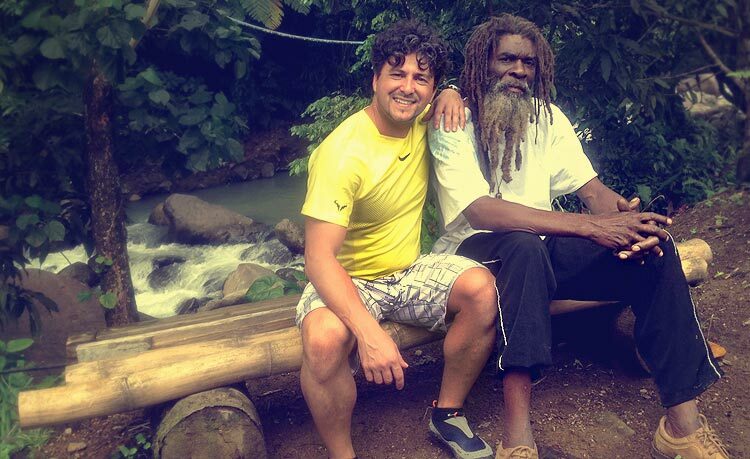 I had the incredible pleasure of doing this with Israel,a local with a passion for Dominica and his Rasta community where I felt welcomed and fed a delicious soup cooked over open fire by his uncle. I also ventured a couple of times into Roseau, the capital of Dominica, a 1.5 hours drive from Melville Hall, it is not to be missed. 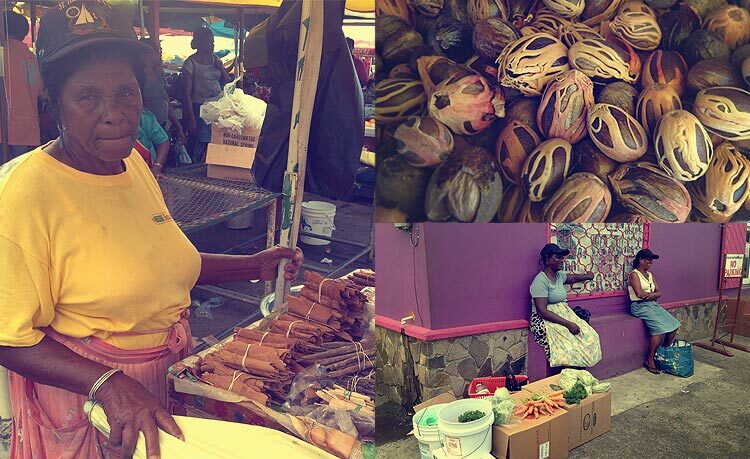 The daily market is a great way to come into contact with the Dominicans and have an authentic, local experience of their culture, and of course it offers wonderful organic produce you can buy. Don’t forget to load up on local spices, I personally was so distracted with taking pictures that I regretted it later not buying more for my friends and family. So many tastes, sights, sounds and touches to interact with at the market! Only a half hour from Roseau is the southern tip of Dominica and the quaint fishing village of Scotts Head. On some local advice I took a short hike up to a vista with phenomenal views of the southwest coast and the Caribbean Sea, with the island of Martinique off to the south. The true joy of swimming in these Caribbean waters felt like being dropped in the biggest tropical fish tank. What makes this part of the island particularly unique is the geothermal nature that causes continuous bubbles coming up from the ocean floor, so swimming in this particular spot feels like you have been dropped into a champagne glass, earning the beach it’s name “Champagne.” It is important that you watch where you are stepping when in the water, one to avoid damaging the coral, and two to avoid stepping on a white or black sea urchin. You may wonder, what about food? 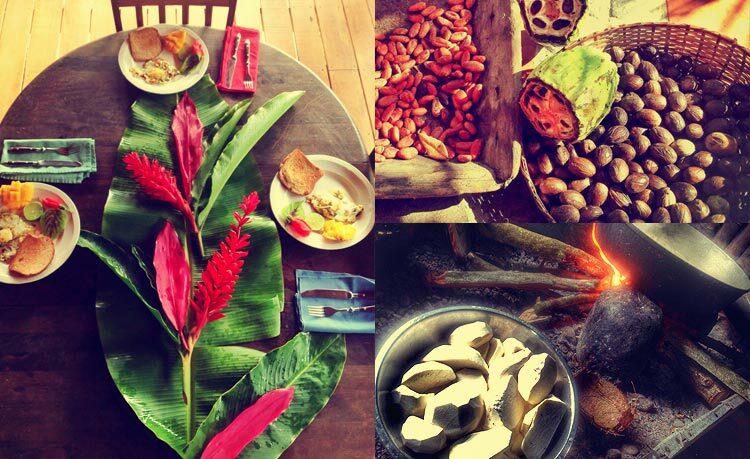 You will be eating the most amazing tropical fruits, some you have never seen or heard of. Coming from Italy and living in the Pacific Northwest I’ve had my share of fish, but the fish in Dominica is fabulous and nothing like the fish back home. 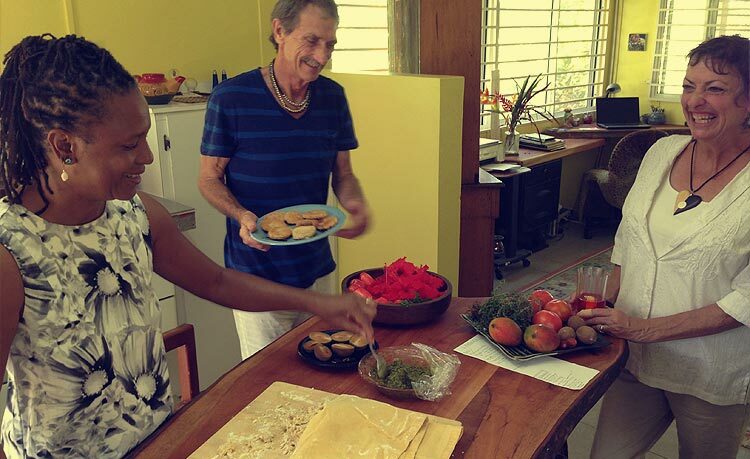 Finally, you must make the time to experience the making of cassava bread, a completely gluten free bread cooked in a traditional way, over an iron plate kept warm by burning charcoals. One day all I had was cassava bread and soursop fruit juice which is not only amazing but the locals use it abundantly for its anticancer properties. Cooking is one of my passions and getting the opportunity to share a kitchen with Sybil was a real treat. Her knowledge of local fruits, veggies and herbs extends well beyond culinary use. She moves about in her little kitchen like a graceful dancer with a happy demeanor and glow making her cooking lesson very delightful, and I walkes away with a wealth of knowledge and ideas. Sybil served us the most delicious tea I have ever had, made with fresh hibiscus flowers and a little ginger. We were invited to eat with her friends and husband Tom (a talented artist) outside on the veranda. Being able to do this first hand before creating this local Experience, left me excited to deliver the same emotions to future clients. Dominica is unlike other islands in the Caribbean and it is not to be missed. As the third island I’ve been lucky enough to visit in this beautiful part of the world, Dominica put a magical spell on me. Its unspoiled nature and beauty touched my soul, the waterfalls, hikes, rivers and pools are a gift to anyone who appreciates nature. Why not travel to Dominica as your next tropical destination, you will not be disappointed and may end up wanting to make this your home like many people have already done or dream about.